You must have seen the terrible scene about how Japan suffered this fourfold calamity; earthquake, tsunami, energy shortage, and nuclear radiation pollution. We are Chinese sisters in Japan and we experienced the earthquake. I’d like to share my own experience since the disaster. Maybe you know that the Japanese are almost all atheists (they do not believe in God), hardly any of them believe the Truth of Christ; though there are churches and many people claiming that they are Christian. We have been praying that the predestined seeds can be shaken and wake up from this earthquake. I know four precious Japanese sisters, but they received the Message delivered by our Prophet Brother Branham abroad. So far, actually, in Japan, almost no Japanese accepts this precious Message. Please do pray for them! As I said it, I felt a little strange. Why did I say that? My family is living here, Japan’s prosperity is important to us; furthermore, we know so many good people here who work as hard as they can, and do as kindly as they can, I do not want to see any disaster comes. However, I didn’t pay much attention to what I said. On March 11th, when I was having breakfast with my daughter, suddenly I asked her loudly, is Japan going to have an earthquake today? She answered loudly, said, “I dunno!” I remembered Bro. Branham talking about Job in the Bible. God and Satan had a talk in the Heaven. God allowed Satan to attack Job. And then Job had a talk with his wife, then the things happened. 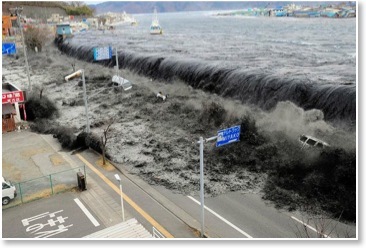 Later on when I talked to another sister on the cell phone, she told me a special dream that she had dreamed about thing relating to tsunami. I thank the Lord that He lets us see things before they come. He loves us and reveals things to us. Prophet Jeremiah saw an earthquake! My personal experience of the quake is this (if you are busy, you do not have to read this paragraph). I was working in front of computer when the shake started. At the beginning it felt like earthquake. Because an earthquake is quite normal in the Kanto region, very often my colleagues and me would just say, “Earthquake!” And then continue our work. But this time it was different, the quake was longer and stronger. I walked out of the office raising my hand saying, “Hallelujah”, and persuaded one colleague of mine to evacuate downstairs. When we reached the ground floor and went out of the building, all the staff, employees and students were gathering. Everyone trembled while they were watching the building shaking, which went on for quite a few while. In the nightfall, I returned to my office and then returned to my home. In my house there is nothing wrong, not one dish or bowl ever damaged in the earthquake. Praise the Lord! It the night of March 11th, the cell phone kept giving alarm and waking me up, so I turned it off. But still, I got waken up by the quake quite some times during the night. It’s still shaking almost every day here. If you read the testimonies from my niece, Sister Kate and my daughter Sister Rebekah, you will see how our dear God protect His children in the disaster! After reading the testimony of my daughter Rebekah, we recalled together about our wonderful experience twelve years ago. One day after we were baptized in the name of the Lord Jesus Christ, we were sitting before the old unit furniture to sort out our belongings, suddenly, a piece of glass fell down from the unit furniture, but it disobeyed the principles of gravity physics, and turned left and followed on to the floor lightly without being broken, this whole process is just like that it is a piece of paper instead of a piece of glass. If God was not on scene, the glass would have hit our face directly! Since that time, God continues to express His love and care for us. God don’t want you to be frowning. God wants you to be happy. The human heart was made to be happy. Worry will cause cancer. Temper will cause cancer. Don’t never be upset. Just walk in His love. Amen. Knowing that you’re walking in Him, and nothing can harm you. There’s nothing can harm you. There’s neither powers, things present, things future, nothing can separate us from Him. We’re in Him. And we never come in by our own will. He, by choice, elected us and brought us in to Him. Amen. So it’s His business to take care of what He’s took Hisself. "No man can pluck them from My Father’s hands, ‘cause He’s the greatest of all of them." Amen. It’s the Father Who takes care of it. Who’s got any more power than God? So what kind of a power have you got over you to take care of you? The whole powers that created the universes. Amen. Thus, I don’t know what’s still coming, however, before God leads us to leave Japan, we believe that Jesus Christ is our only absolute refuge. Hallelujah! Amen! Please pray for any predestined seed in Japan and the believers here!